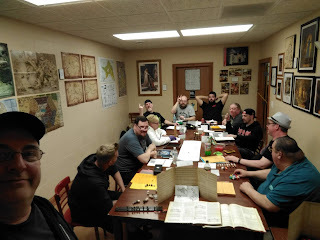 Well, the group was left frozen in time the previous session as they needed to decide if making a strategic retreat and leveling up outweighed whatever advantage they might have from surprising the cultists of Marak Tor. They had carefully approached, caught a few unaware and dispatched them, but at least one had gotten away after noting some arrow fire and a cleverly laid trap. If they charged in immediately, though with some party members not in attendance, they might gain some advantage early on but they also knew the numbers were heavily against them. In the end, as their first act after restarting the clock this time around, they headed back to civilization to resupply, gather more of the group (ten players this week! ), level up, and report what new information they gained. But they would not be denied and returned to Marak Tor stronger than ever. This proved to be a wise move because although the cultists knew they were returning, and set up an ambush and a further choke point, the adventurers withstood what was thrown at them and cleared their way down to the main temple, defeating nine more cultists along with ten of the personal bodyguards of the Witch of Dour Haven. Though she had a hand in the battle, heating up the armor of one of the top fighters and adding green slime obstacles in the group's path, the temple defenses were not strong enough to keep the party from a victory. Now with the temple secured, what lies behind the scenes needs to be discovered, the witch needs to be located, and whatever else might be awaiting the brave adventurers must be faced. I wish them well . . .